LONDON, England (CNN) -- Two British hostages held in Iraq since 2007 are probably dead, British Prime Minister Gordon Brown's office said Wednesday. 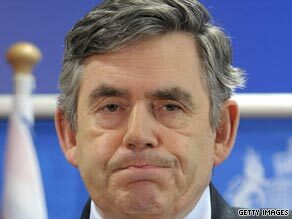 British Prime Minister Gordon Brown has told the families of two hostages that they are probably dead. The British government has recently informed the families of British hostages Alan McMenemy and Alec MacLachlan that they were now likely to be dead, Brown said in a statement on his Web site. "This is the worst of news, and my thoughts are with the families, whom I hope will be given the privacy they need to deal with their grief," he said. He also urged the hostage-takers to release Peter Moore, another Briton seized at the same time. "I and the entire government are committed to doing everything that we can for the release of Peter Moore, whom we still believe to be alive," Brown said in a statement. Hostage-taking is never justified and has no place in Iraq's future: I condemn it unreservedly, and once again call on the hostage-takers to release Peter Moore and give us clarity on the fates of Alec MacLachlan and Alan McMenemy." The families of the three hostages pleaded earlier Wednesday for their release. "These reports are the worst possible news for us but we continue to hope they cannot be true. Whatever Alec's condition, he no longer should remain in Iraq," said Haley Williams, MacLachlan's ex-girlfriend. "We appeal to those holding him to please send him home to us. I speak to you as the mother of Alec's son," she said. "Please send him home because as a family we can't cope with this anymore." "I would ask the men that are holding the boys hostage to please let them go now. Enough is enough," said Pauline Sweeney, the stepmother of hostage Peter Moore. The bodies of two other hostages were recovered and returned to the UK last month. "We've been to the two funerals of Jason Creswell and Jason Swindlehurst," Sweeney said. "And now are informed, allegedly informed, that Alan and Alec are no longer with us. "I plead to the hostage takers to send home the bodies of Alec and Alan so that their parents can have closure and move on, and I appeal to them to please let Peter come back alive," she said. Five men were kidnapped from the Iraqi finance ministry in Baghdad in May 2007 -- computer analyst Moore and security guards McMenemy, MacLachlan, Creswell and Swindlehurst. They were seized by people posing as security forces and government workers on official business. CNN has not confirmed if the men are dead or alive. The security guards worked for Canadian-based security firm GardaWorld, according to the company. Moore worked for U.S.-based BearingPoint. At least three videos have been released by the kidnappers, a little known-group calling itself The Islamic Shiite Resistance of Iraq. In December 2007, the Arabic language TV station al-Arabiya showed a video of a man who identified himself as "Jason." He says on tape that the date is November 18. The hostage-takers demanded in the video that all British troops be withdrawn from Iraq within 10 days or they would "kill the hostage... as an initial warning." In February 2008, Peter Moore appeared in a second video, pleading with the British government to perform "a simple exchange" of prisoners with his captors so "we can go home." "It's a simple exchange -- release those that they want so we can go home. It's as simple as that. It is a simple exchange of people. This is all they want, just have their people released," he said. The British Embassy in Iraq received a third video in March of this year but refused to disclose its contents. CNN's Charlotte Hayward contributed to this report.